Q: Is "Rebel Without a Cause" based on a book? Q: What was Jim humming in the police station? Q: What is 'Rebel Without a Cause' about? 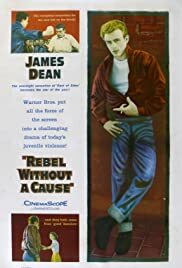 With short, slicked-back hair, blue eyes and thick red lips, and dressed in a white T-shirt, blue jeans, and bright red jacket, James Dean creates a lasting visual impression as youthful Jim Stark, the prototype high school outsider, alone and troubled. Dean's on-screen persona, together with his vivid, intense performance, overwhelms all other elements in this film about 1950s teenage confusion and angst. Newly arrived in town, Jim Stark finds himself trapped in a typically hostile high school, and confronted by an in-crowd of leather-jacketed hoods with names like "Buzz", "Crunch", and "Goon". They challenge Jim's honor by calling him "chicken". What to do? Jim asks his weak, mealy-mouthed father (well played by Jim Backus). But his father is no help. Indeed, the film conveys a grim view of adults: self-indulgent, weak, insensitive, unobservant, and inept. Then there's "Plato" (Sal Mineo), the high school kid who has always been alone, with no apparent father or mother. In Jim Stark, Plato has finally found a friend. Eventually, another student joins Jim and Plato. Judy (Natalie Wood) changes her caddy behavior toward Jim after an event changes her life. But it's still a hostile world, and the bond that these three young people form, as substitute family, is fleeting, en route to a poignant ending. The film's characters and thematic tone are representative of a Cold War era in America when the threat of nuclear annihilation hovered over everyone and everything like the sword of Damocles. And thus, the story's astronomy motif amplifies a sense of loneliness, insignificance, isolation, and helplessness, so characteristic of the 1950s. There are things about this film I do not care for. The compressed widescreen projection in "CinemaScope" is annoying. The music, which varies from jazz to rhythm and blues to nondescript noise, is too loud and too manipulative. And there's something vaguely contradictory about a macho James Dean in the role of Jim Stark, whom bullies pick on. But none of these irritations can diminish the thematic depth of the story. 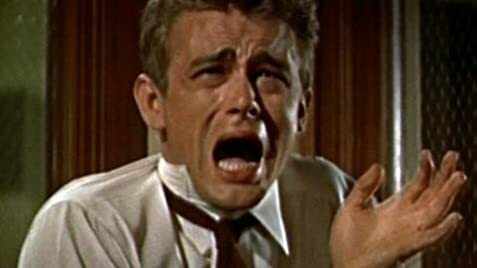 Nor can they diminish the overpowering presence of James Dean, the actor, the perfect Hollywood symbol of youthful "cool", whom actors subsequently looked to as a model of acting excellence and cinematic charisma.